UPPER: No-sew synthetic-leather midfoot for lightweight, structured support. A forefoot lockdown strap and zippered shroud deliver a snug, secure fit. MIDSOLE: Hard-density EVA wedge for durable cushioning. OUTSOLE: ¾-length nylon plate with seven replaceable spikes for powerful traction. Forefoot plate features dynamic flex for a more natural foot plant on takeoff. 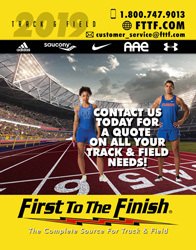 Designed for the serious long jump and pole vault athlete looking for the latest in jumping technology.